ADA Compliance Consultants: 10 Years Later | ADA Compliance Consultants, Inc.
ADA Compliance Consultants began in the spring of 2004 with myself and two employees working from inside a 9’ x 23’ section of my garage in Folsom CA. By the end of 2006, we were seven employees strong servicing clients nationwide. With an energetic inspection department and a full service design department, we brought new meaning to the phrase “One Stop Shop” for the ADA consulting industry. With a “local touch on a national level”, ADACC continued to grow and expand throughout the country. In 2010, we witnessed the first big change to the Federal ADA codes. Our business continued to grow throughout the country with large nationwide commercial clients requesting inspection reports, construction documents, and expert witness services to fight the rise of frivolous ADA lawsuits. In August of 2012, I moved my family to Austin, Texas to open up our second office. We hoped to be able to service our clients throughout the South West, while leaving a great team behind in Folsom to continue servicing our clients in California and the western states..
Over the last two years, I have experienced the wonderful culture, food, music, and oh yeah — sports — that Austin is so famous for while growing our client base rapidly throughout the region. But, when my wife and I got pregnant earlier this year, we both took a step back to examine how much I had been away from her and our four children.. We decided to move back to our hometown in Northern California that we missed so much. In August, we made the official move back to Newcastle, CA to live in the country and to reconnect with our team in Folsom. I still travel to Austin and the East Coast to service our clients while cultivating relationships here on the West Coast. 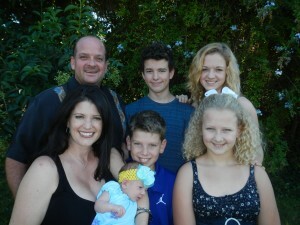 The Taylor family! Chris, Hastin and Breah along with my wife, Janelle, Cameron, Mickey and our newest addition, September! It is truly a blessing to be back and have a new addition to The Taylor family! September Grace Taylor is now 5-weeks-old and the perfect compliment to her two sisters and two brothers. Breah is now 16, Hastin 15, Cameron 13 and Mickey is about to turn 11. Janelle and I couldn’t be more blessed to have four wonderful children to love and adore their new sister in ways that exceeded our expectations. I’m so very thankful for all of our friends & clients who supported and encouraged us to make the move to Austin, which allowed us to grow so many business and personal relationships that will last a lifetime. And to be honest, I am equally thankful and relieved that everyone in my Folsom office let me come back and continue to be a part of the most awesome team in our company’s history! For a while, there it seemed that the longer I was gone, the better things ran. I couldn’t have asked for a better team! I look forward to working with each and every one of you as the year moves towards the holidays and a new season! Thanks to everyone, it’s great to be back! ← What’s the story with truncated domes?